Mish's Global Economic Trend Analysis: Failure to Consider Constraints - My Response to "Has Mish Deflated the Inflationistas?" Failure to Consider Constraints - My Response to "Has Mish Deflated the Inflationistas?" I am rather amused by an article on Mises by Robert P. Murphy called Has Mish Deflated the "Inflationistas"? I was aware this article was coming, Murphy told me in advance, and I rather expected some hard hitting piece on inflation (or at least some semblance of inflation discussion) saying why deflationists are wrong, and more specifically why my deflation theories are wrong. Instead Murphy outlines a number of allegedly bad calls I have made on the stock market, the US dollar, and treasuries. I admit I got some calls wrong, and Murphy did too as he admits. Actually anyone who makes short-term calls is bound to get a huge percentage of them wrong. Nonetheless I did call the top of the housing market on time in summer of 2005 as well as numerous real-time updates. For a synopsis of data points, please see Housing Update - How Far To The Bottom? I called the stock market top on the S&P 500 in July of 2007 in Quotes of the Day / Top Call. And no, I did not make numerous top calls on the way up. I was however, a few months and a few percentage points early. The Stock market made a new high in October. On the exact day the market topped, I received an email from someone telling me that he was having turkey for Thanksgiving and I was the turkey. I highlighted a sequence of treasury calls in Daniel Amerman vs. Mish: Reflections on the Great Inflation/Deflation Debate that I am quite proud of, but no I did not get every turn correctly. However, inflationistas have generally been wrong about treasuries for a decade. With most inflationistas screaming a dollar collapse is imminent, I have generally taken positions for a dollar rise when anti-dollar sentiment has been extreme. No my timing was certainly not always perfect, but I stand by the ideas I presented. While everyone was rah-rah on the Euro, I calmly pointed out problems in Greece, Spain, the Baltic states, and European banks that would matter. They did. And I think they will matter again. That I prematurely called the end of the recent bounce in the Euro is of little concern to me. I am not a day trader, or even a short-term trader. I am looking at the global economic picture, with eyes on risk management. Moreover, Murphy took statements out of context. The time to be bullish on the Euro was at the 1.18 to 1.20 level, not now (although I suppose the Euro could bounce a bit higher still). Looking ahead, a key question for the Euro is whether or not the European governments adhere to their austerity measures (I rather doubt it). A second factor is the alarming rate at which the ECB is supporting Spain. How long can that continue? Factor that all in, and the possibility of the US dollar rising to 1.15 or even to parity vs. the Euro is not out of the question. In a complete distortion of reality Murphy translated my sentence "the possibility of the US dollar rising to 1.15 or even to parity vs. the Euro is not out of the question." into a short-term prediction the the Euro would soon fall to 1.15 even though I mentioned the possibility the bounce could go on longer, and I gave no timeframe for the drop. 9. What's the question we should have asked, but didn't? What's your answer? Mish: I guess it would be: "Does your crystal ball have a forecast for the stock market? For Gold? The US Dollar?" Let's start with gold. I see articles everyday by some prominent people saying things like "I know gold is going to ... whatever". The thing is, they don't know and neither do I. Only a charlatan or a fool can make such a claim. Of course the fools and charlatans may be right, but it is not because they "know" anything. One thing I do know is that I don't know things of that nature. That puts me ahead of all those who claim to know the unknowable. I prefer to look at things in terms of probabilities. It is highly likely the Fed embarks on Quantitative Easing. That should be good for gold, but short term that QE may easily be priced in. Moreover, the Fed may go slower than what the market thinks. Thus, there could be a huge "sell the news" event in both gold and the stock market on the QE announcement, no matter what that announcement is. Should that happen, given that gold is in a long-term bull market, and given that Bernanke will likely go back to the QE well, I expect buying the next big dip in gold would be a higher probability event than buying a 10% correction in the stock market. There is a lot going for gold, but it is by no means a "sure thing". Is the Equities Bottom In? Many people claim the "Bottom is In"? Is it? How can they know? I am not even sure if the bottom is likely in. Look at the half-dozen 50% or greater rallies in the Nikkei over the course of two decades, all taken back and then some. How many "knew" that would not happen. How many in the US "knew" that housing prices could not possibly collapse. I am quite sure that stocks are richly priced, but that sure does not mean stocks cannot rally further from here. We are in a credit bust scenario with enormous deflationary pressures, even if outright deflation is not sustained. As such, the risk in equities is a lot higher than most think. There is a lot of confidence in the Fed's ability to produce inflation. 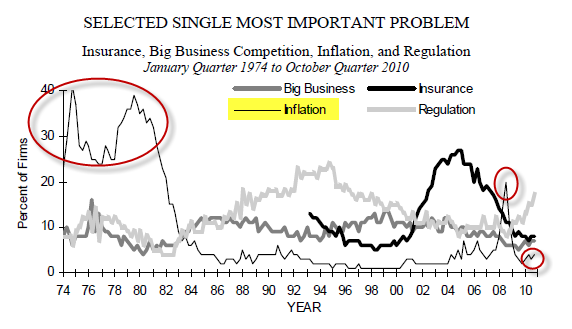 Indeed, I think there is a bubble of confidence in the Fed's ability to produce inflation. Should that bubble burst, equities can collapse far faster than most think possible. All things considered, I am pretty pleased with my calls, especially on gold, treasuries, and in spite of what Murphy says, the US dollar. Now About That Inflation Discussion?! Robert kicked off his article with a sentence "Over the last two years, I have gotten perhaps dozens of requests to "deal with" the deflationist approach of Mike "Mish" Shedlock." My long-term stock market call still stands: the bottom may or may not be in, however, the stock market is not a measure of inflation. Moreover, and although Murphy went to great lengths to point out the rally in equities, I calmly point out Japan had at least six 50% rallies in the last two decades but the Nikkei sits near 10,000 down from a high of 38,000. I still see no reason why the S&P could not or should not do the same. Indeed I did suggest this would play out over as long as another decade so I am not concerned about a single year that does not fit a pattern I suggested. I have also on numerous occasions, although not in the article he mentioned, pointed out alternate possibilities like a stock market that goes sideways for 5 years while earning catch up to valuations. The only statement Murphy made on the alleged topic of his post was that he and Gary North "think Bernanke has the power to raise prices if he so chooses". There was no discussion of ideas involving that belief. All we saw was a stated belief. We did not even see a definition from Murphy about what inflation is. Can Bernanke Force Prices Higher? I say not really, at least without serious consequences. I am not the only one who believes that. Ben Bernanke now believes that. Please consider Bernanke Calls On Congress To Help The Economy -- For At Least The Fourth Time In Five Months. For at least the fourth time since June, Federal Reserve Chairman Ben Bernanke publicly urged Congress to combat the lackluster recovery by increasing government spending, a recommendation that has gone unheeded by lawmakers. In a speech at a conference of central bankers in Frankfurt, Bernanke once again said the Fed cannot save the economy on its own. The Fed's recent move to add to its ballooning balance sheet by committing to buy up to $600 billion of government debt faces "limits" to its effectiveness, Bernanke said. The rest of the government, the chairman added, could aid the Fed's efforts by hammering out a plan for stimulative spending. So while Murphy and North think Bernanke can force prices higher, even Bernanke finally admits he needs help. This by the way goes along with a statement that I have made numerous times over the years. "The FED can print money but it can not dictate where the money goes." If the Fed could dictate where it went, unemployment would not be near 10%, and prices would be going up 2% annually (Bernanke's inflation target). The year started out with the U.S. core (excluding food and energy) consumer inflation rate at 1.8% YoY; now, it is at a record low 0.6%. This has occurred even with massive government stimulus, U.S. dollar weakness, a commodity boom and an ongoing inventory cycle. Imagine what would happen if these developments reversed course. Imagine what would happen if these developments reversed course. But the reality is that if the deceleration of the past eight months persists, then the core inflation rate will become the core deflation rate by the second quarter of next year. Hence Bernanke’s quest for QE2. Excluding shelter, core consumer prices actually deflated 0.05% (to the second decimal place) and this followed a 0.03% dip in September. The last time this metric declined in successive months was back in November-December 2008 when the financial system and the economy were imploding. Now, it is simply a case of a listless recovery failing to redress the vast amount of excess capacity overhanging the macro scene. And, the deceleration has been very broadly based. Core goods prices have declined 0.24% for two months in a row, despite what commodities and the dollar have done. The YoY trend is now basically flat — it was 2% last March. Core services (which exclude energy) have been rising by only 0.1% or lower now for four months running and the YoY pace of 0.8% is a record low. New car prices dipped 0.2% MoM last month, the first decline since April. Used car prices were down 0.9%, the second falloff in a row and the first back-to-back decline since the depths of despair in March-April 2009. Hotels saw a 1.3% price slide — negative now for three months in a row. Electronics prices dropped 0.1% in October and have deflated for four months running. Communication service prices fell 0.2% in October and are down three months in a row. If Bernanke Wants 2% Inflation, Why Don't We Have It? Of course North and Murphy will point out that gasoline prices are soaring and they may claim food prices are soaring too, although I do not believe the latter and I do most of the shopping. Commodity prices certainly did soar. Regardless, that point is it is irreverent because Bernanke does not want oil prices or food prices to rise, he really wants housing prices to rise, and prices of stuff in general to rise. Yet, in spite of $2 trillion in agency purchases to support home prices and home sales, prices are falling and home sales are at all time record lows. Murphy ignores constraint after constraint. First off, I do not think Bernanke can cause prices to rise at will, but IF he can, it clearly is not the prices he wants. "The FED can print money but it can not dictate where the money goes, or indeed if it goes anywhere at all." Murphy and inflationistas need to read that sentence 100 times and understand the practical implications of it. Rising commodity prices without a pass-through to consumer prices kills profit margins and especially destroys small businesses. That fact imposes a serious constraint on Bernanke. 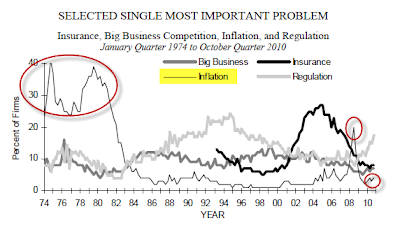 Historically inflation measured as a big concern in the mid-to-late 1970's. Inflation concerns spiked again in the summer of 2008 along with gas prices. In spite of a huge recent rally in commodities there is no fear of inflation now. From the report "Seasonally adjusted, the net percent of owners raising prices was a net negative five percent, a six point increase from September. Plans to raise prices rose five points to a net seasonally adjusted 12 percent of owners. However, most plans to raise prices have been frustrated by the recession and weak sales during the past few years." The number of business owners raising prices is a net negative 5%. The profit squeeze continues as small businesses are not able to pass along rising input prices. The result is easy to spot: " far more owners report that earnings are deteriorating quarter on quarter than rising." The Fed can force prices up? Really? If the Fed could it would, and as I noted above the Fed admitted it cannot without the "help" of Congress. Here is another constraint on the Fed: Unlike Congress, the Fed, cannot give money away. It simply cannot, at least legally, and that is a statement of fact. Sure the Fed can monetize the debt, and it is doing so right now, but anything in addition to that just may sit as excess reserves. If consumers do not want to spend, and businesses do not want to expand, there is not a damn thing the Fed can do about it. That is a statement of fact as well as a constraint on the Fed, and that is why Bernanke is running around like a chicken without a head right now, getting involved for the first time in history on fiscal stimulus issues. Although I have pointed out the Fed cannot give money away, the simple fact of the matter is the Fed would likely not do it even if it could. The Fed does not want to wreck the banking system. The Fed is beholden to banks and does not really give a damn about consumers other than they earn enough to remain debt slaves forever. Further comments from Bernanke about his struggles to create inflation and spur jobs can be found in Bernanke turns up heat on China currency policy. Thus the actions of other governments pose additional constraints on the Fed. By the way, gasoline and commodity prices are more of a function of huge inflation in China, not the US. Both money supply and credit are soaring in china while credit collapsed in the US for 10 straight quarters. Inflation is rampant in China, not here. What About Negative Interest Rates? Gary North has made the claim the Fed could force banks to lend by announcing "from this point on, all money deposited by banks as excess reserves will be charged a storage fee. This fee could be 2%." Really? Perhaps Banks would buy short-term treasuries at 0%. Perhaps they would park the money in gold futures. However, even if the Fed could control those possibilities, there is still one other big constraint: Paying interest on reserves slowly over time helps to recapitalize banks. Force them to lend and losses increase. Bernanke wants to help banks recapitalize. He does not want banks to make poor loans just to make them. That is an obvious constraint that Gary North misses. Moreover there are new Basel capital requirements coming up. And finally, the reason banks are not lending is out of capital concerns. Banks need those "excess reserves" to handle additional (and huge) mortgage-related losses not yet realized. Inquiring minds may wish to read Ben Bernanke's Washington Post Op-Ed What the Fed did and why: supporting the recovery and sustaining price stability. The Federal Reserve cannot solve all the economy's problems on its own. That will take time and the combined efforts of many parties, including the central bank, Congress, the administration, regulators and the private sector. That's a heck of a lot of help needed. Admittedly the sentence says "solve all the economy's problems", but can the Fed solve any problems including Bernanke's concern over price deflation? Inflationistas in general simply do not understand the role of attitudes. If consumers do not want to spend they won't. Boomers are headed into retirement scared half to death. In aggregate they are looking to downsize, not upsize. They have insufficient savings. They no longer want to keep up with the Jones. Consumers are without a doubt cutting back on frivolous expenditures. This puts negative pressure on asset prices as well as the prices of goods and services. More importantly it puts huge stress on the demand for credit by businesses and consumers alike. Let's not forget about global wage arbitrage. Even if Bernanke could force up prices, he cannot force up wages. Rising prices without rising wages would increase the number of defaults. Let's not forget the implications of 6 New Governors Seek to Kill Defined Benefit Plans; 8 of 9 CA Cities Vote to Reduce Benefits; Fraudulent Promises (and what to do about them). We have yet begun to feel the deflationary economic implications of state cutbacks in employment, wages, and benefits. We will. And it is not at all in Bernanke's control. He needs help from Congress. I suggest he may get some help, but nowhere near as much as he needs. On December 14, 2009, in A Case for the Inflation Camp Robert P. Murphy asks When Will the Inflation Genie Get Out of the Bottle?Murphy's concern is over "excess reserves". Price increases showed up primarily in asset prices (but not housing), and also at the gas pump. However, they sure did not show up in the CPI as noted above. That's besides the point. The key point of discussion is Murphy's misguided notion that excess reserves work their way into the economy 10-times over spawning massive price inflation. That notion, although widely believed, is simply false. According to Money Multiplier Theory (MMT) and Fractional Reserve Lending, excess reserves may be lent out as much as 10 times over and when that happens, massive inflation will result. In Roving Cavaliers of Credit Australian economist Steve Keen has made a strong case that lending comes first and reserves later. I discussed that at length in Fiat World Mathematical Model. Please consider BIS Working Papers No 292, Unconventional monetary policies: an appraisal. The underlying premise of the first proposition is that bank reserves are needed for banks to make loans. An extreme version of this view is the text-book notion of a stable money multiplier. In fact, the level of reserves hardly figures in banks’ lending decisions. The amount of credit outstanding is determined by banks’ willingness to supply loans, based on perceived risk-return trade-offs, and by the demand for those loans. The main exogenous constraint on the expansion of credit is minimum capital requirements. A striking recent illustration of the tenuous link between excess reserves and bank lending is the experience during the Bank of Japan’s “quantitative easing” policy in 2001-2006. Despite significant expansions in excess reserve balances, and the associated increase in base money, during the zero-interest rate policy, lending in the Japanese banking system did not increase robustly (Figure 4). Is financing with bank reserves uniquely inflationary? If bank reserves do not contribute to additional lending and are close substitutes for short-term government debt, it is hard to see what the origin of the additional inflationary effects could be. There is much additional discussion in the article but it is clear that Money Multiplier Theory as espoused by Murphy, North and others did not happen in Japan nor is there any evidence of it happening in the US, nor is there a sound theoretical basis for it. In fiat based credit systems, lending comes first, reserves come second, and extra reserves do nothing much except pay banks to sit in cash in cases where interest is paid on excess reserves. Murphy can believe what he wants but he sure did not address any issues of substance in his piece. By the way, I want to point out my definition of inflation and deflation once again. Inflation is a net expansion of money supply and credit, where credit is marked to market. Deflation is the opposite: a net contraction of money supply and credit, where credit is marked to market. By that definition, consumer prices and the stock market are symptoms of inflation and deflation not a definition of it. There are many more symptoms. Not all symptoms need be present all the time. I have stated on many occasions that if deflation is defined as an increase in prices, we may or may not see it. By my definition we were in deflation in 2007 through March 2009 and we have probably been in inflation since then. I thought we were slipping back into deflation but the Fed temporarily put a halt to that with QE II. That does not mean the Fed will be successful. Indeed I think they won't be, at least on a permanent basis. I have been saying for 5 years the US would follow the path of Japan. An interesting chart in the New York Times shows this is indeed what has happened. Bernanke wants prices to rise 2% a year. One problem is he does not count food, energy, or housing. Although OER (Owners Equivalent Rent) is the largest component of housing, rent and housing prices are two different things. Property taxes and sales taxes are yet another thing, and those are not factored into the CPI either. We are clearly following the path of Japan, especially if we include an analysis of housing and equity prices including the Nasdaq. Yet to the pocketbook of the average US citizen, costs are going up, wages and benefits are going down (except of course for Wall Street and public employees). Regardless of what your position is regarding measuring inflation (prices or credit-based), Bernanke is horrendously wrong. It is sheer madness in a world of global wage arbitrage, where 14 million are unemployed, where the unemployment rate is close to 10%, to pursue a policy of attempting to force prices up, to meet some asinine idea that prices need to rise 2% a year, when to the perspective of the average consumer prices are going up much more than that, via taxes alone, let alone the grocery store and gasoline pump. Berkanke's policies are just as mad from the perspective credit. In a fiat credit-based regime, there will be no significant sustainable hiring or economic growth when consumer and business credit is collapsing. Net credit creation has been negative for 10 quarters. Bernanke is attempting to stimulate lending, and the Fed can print all the money it wants. However, the Fed cannot force banks to lend or consumers to borrow. For now, Bernanke's efforts have caused rising commodity prices, which is hurting small businesses that cannot pass on those price increases because consumers are tapped out. The net effect of the policies of this Fed and this administration is small businesses are getting crucified in a price squeeze. Thus, whether you view inflation from a price perspective, or from the proper perspective of credit expansion, Bernanke is simply wrong. His policies have failed. No sports fans this is not the start of blog wars. Although Murphy did an anemic job of covering any issues of merit regarding the inflation-deflation debate in his article, I wholeheartedly endorse his post My Debate Challenge to Paul Krugman in which he challenges Krugman to a debate on Austrian versus Keynesian business-cycle theory. Murphy has over $50,000 in pledges as of a couple weeks ago. The goal is $100,000. 95% of the pledges will go to the Fresh Food Program at FoodBankNYC.org. To make a pledge please click on Murphy-Krugman Debate. Beating Krugman should be easy enough, and the results should be entertaining.